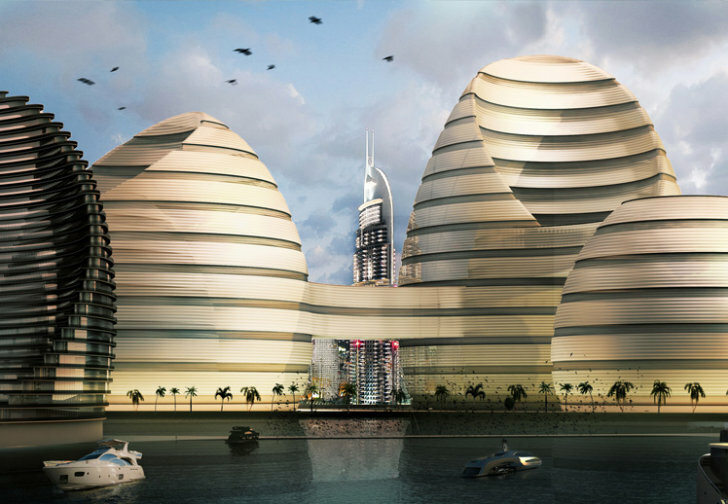 These organic buildings designed by Luca Curci Architects could one day create a coastal megalopolis in the United Arab Emirates. Organic Cities is a master plan featuring multi-purpose land and sea buildings designed to adapt and evolve over the years and meet the needs of growing cities. The site features lots of green space in addition to residences, hotels, commercial space and all the amenities necessary for a city. Organic Cities is a concept for an addition to the coastline somewhere in the United Arab Emirates that will merge with existing cities to create a more organic megalopolis. The inspiration for the buildings came from natural and organic forms that can handle the elements, especially the harsh sun and wind. Consisting of both land- and water-based buildings, proposal will offer up a variety of experiences, vistas and options for residents and visitors. Luca Curci’s project is organized in two groups — “organic buildings” on the earth, and “moons” on the sea. The moons can be accessed by water, air and some by connecting bridges and will serve as residencies, private homes and hotels. The land-based buildings will have more hotels and residences along with offices, commercial spaces, retail, galleries, museums and more. Most of the site will be green space for recreation, but will provide enough space for 150,000 inhabitants. Luca Curci Architects views the project as a way to adapt and to evolve, while providing inhabitants with a social, active and healthy life. Hopefully there will be more sustainability measures worked into the plan and this will not just be another massive resort. 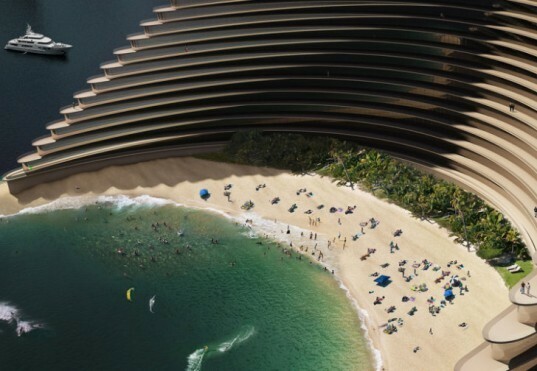 Organic Cities is a concept for an addition to the coastline somewhere in the United Arab Emirates that will merge with existing cities to create a more organic megalopolis. The inspiration for the buildings came from natural and organic forms that can handle the elements, especially the harsh sun and wind. Consisting of both land- and water-based buildings, proposal will offer up a variety of experiences, vistas and options for residents and visitors. Luca Curci's project is organized in two groups — “organic buildings” on the earth, and “moons” on the sea. Concept drawing of one of the interiors of a residence. The moons can be accessed by water, air and some by connecting bridges and will serve as residencies, private homes and hotels. The land-based buildings will have more hotels and residences along with offices, commercial spaces, retail, galleries, museums and more. Most of the site will be green space for recreation, but will provide enough space for 150,000 inhabitants. Water-based buildings enjoy private coves in which to enjoy the ocean. The land-based buildings will have more hotels and residences along with offices, commercial spaces, retail, galleries, museums and more. Luca Curci Architects views the project as a way to adapt and to evolve, while providing inhabitants with a social, active and healthy life. More than 800,000 square meters dedicated to hotels, spa, wellness areas, 6,300,000 square meters to shopping malls, galleries, museums, 4,500,000 square meters to offices and other social services. The tallest building will reach 470 meters and the tallest moon will reach a height of 190 meters.